Aside from having a page to place conversion tracking codes, the Thank You page is a good opportunity to keep your visitors engaged after a conversion. Just because you already got what you (originally) want doesn’t mean you should stop there. When optimising landing pages for pay per click traffic, it is recommended that you keep your visitor locked in and discourage them from navigating away. As much as possible, remove links to other pages or your social accounts. You have a single call-to-action and that’s all you want them to focus on. If you already got your visitors interested enough to complete that action, then it’s likely that they will also perform a second action. What is the next step? Anticipate this and use your Thank You page for it. Strike while the iron is hot! And the best thing about it? It’s practically free! 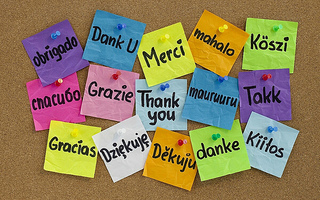 The obvious purpose of the Thank You page is to say “Thank You” for the conversion. It should assure the visitor that the action was successful, and that you have received any information they submitted. This is also where you place your tracking codes to reflect conversions in Google AdWords or Analytics. It is also good business etiquette to let the visitor know what to expect next, and when. Mention if they will be receiving an email, a phone call, or a package, and how long they will have to wait. The basic messages mentioned above can be relayed in 3 to 5 sentences. You have a warm lead staring at a bare page. What now? 1. Provide more insight on your business. This is especially useful for landing pages that call for enquiries about products or services. Your prospects would want to know more about you before they close a deal. You already got them interested, so provide them with something more to secure their trust and make them want to look forward to your response. You can do this by adding a short “About Us” paragraph, providing a mini-portfolio of past work, or compiling social proof. Encourage your visitor to check out the other things that you have to offer. You don’t really want to do this on the landing page itself because it might distract your prospect from completing a conversion. 3. Encourage them to be a repeat customer. Freebies make happy, loyal customers. If they’ve bought something from you for the first time, you can give them a small token to get them to come back and buy more. You can offer discounts and place coupon codes on your Thank You page. Do you have free white papers, ebooks or other relevant resources that your visitor might be interested in? Get those links up on your Thank You page. This is where you can provide links to your social media accounts or your blog, and get them to follow or subscribe to be updated on your latest news or promotions. There are no hard and fast rules as to what your Thank You page should be like. You can do without it, but we certainly don’t recommend that. Ask us how you can take advantage of your Thank You pages to boost your online marketing.